Do you remember your first waiver? You had likely just turned 18 and signed up to do something fun (or crazy). Maybe it was a race, skydiving, bungee jumping, or rafting. You walked up to the registration table and a volunteer handed you a piece of paper to sign. There was a small rush of pride at the responsibility of signing the waiver without needing the permission of a parent or guardian. These days, 18-year-olds may have a little bit of a different experience. While they still get to feel that rush of pride from signing on their own, they may not be signing a paper. Online waivers are the newest trend for agreements of all sorts. From liability to rent agreements, digital waivers create an easier signing process for participants as well as a simple collection process for the host organization. This complete guide will help your organization understand online waivers and get started looking for a software provider who will offer all of the necessary features for a simple yet thorough agreement process. Online waivers don’t need to be a drag or a hassle. Let’s dive in to learn more about how they can impact your organization! For such a simple question to ask, the answer may seem unsatisfying. Who needs online waivers? Anyone. Any organization that requires waivers to make agreements with event participants, customers, volunteers, coworkers, or anyone else can use online waivers. Organizations use waivers for physical activities such as walkathons, equipment rentals for items such as kayaks, or even agreements at the dentist. How many waivers do you expect to be signed? Storage for online waivers tends to be more organized and easier to handle than for paper waivers. What types of information will you require? You rely on people’s handwriting on paper waivers, so consider the types of questions you ask and how legible you need the answers to be. How often will you search through the waivers? It can be tough to manually search through paper waivers. However, digital ones are easy to search through based on keywords and attributes. Waivers are a great opportunity for organizations to receive consent or permission for adventures, activities, and programs. However, it’s also a great opportunity to get information about participants to save in your CRM. For example, you may ask someone if they consent to receive promotional materials from your organization. If they agree, you can add them to an email list. Or maybe you want to segment participants by gender so you save the information they add about their gender on the signed waiver. Organizations can use online waivers for all sorts of activities. In fact, these handy tools are often included in referrals for event management software toolkits! One of the first things that people worry about when it comes to online waivers is their validity. If that’s what you’re worried about, we have some good news! The waiver must be unalterable in digital form. The waiver must be accessible to the consumer. The consumer must give consent to sign electronically. If you’re curious about other regulations regarding digital waivers, be sure to go through and catch up on your U.S. and state laws and statutes regarding waivers. Digital waivers offer better storage opportunities for nonprofits. You can store information in digital folders instead of in physical files. Plus, they are easy to send and receive, saving your nonprofit a lot of time. There’s less room for human error in the management or placement of waivers when everything is completed online. 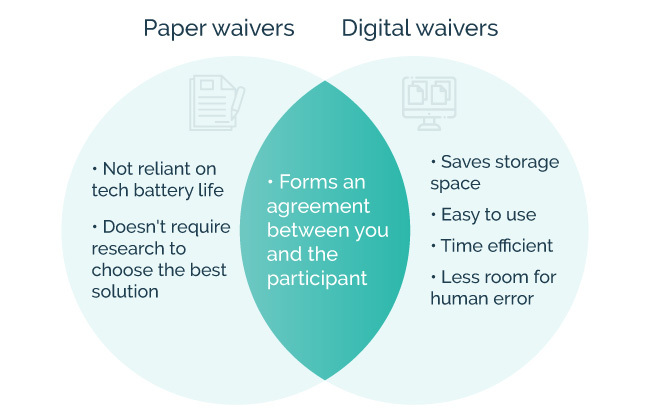 While digital waivers can be signed in person, you’re reliant on the battery life of your mobile kiosk or tablet. We suggest bringing a charger or additional tablet as a backup. Paper waivers also require less research time to get started because you don’t need to look up the best software solution (a question that we’ll answer by the end of this article). Before investing in online waiver software, you’ll want to make sure you’re getting all of the features you need so that your waiver includes the elements required for success. A custom waiver editor. Custom editing allows your organization to personalize your waivers with your brand’s colors, logos, and fonts. This helps consumers identify the content as belonging to your organization. Unlimited waiver templates. Waiver templates help you find a starting point in the waiver creation process. Make sure you can save as many templates as you need and display them on a single screen. Multiple initial and signature boxes. Throughout the body of your waiver, you may find the need to include multiple locations for initials or signatures. Don’t limit yourself! Be sure you have access to as many of these elements as you need now and for future waivers. Flagged questions. Flagged questions will alert participants when a particular answer is chosen. For instance, if a participant selects “no” for giving consent to a liability release clause, they won’t be able to submit the form until the correct answer “yes” is chosen. Photo capture. The photo capture feature provides you the opportunity to snap a picture of the person signing the waiver. This adds an additional layer of identification to the digital signing process. Safety video embedding. 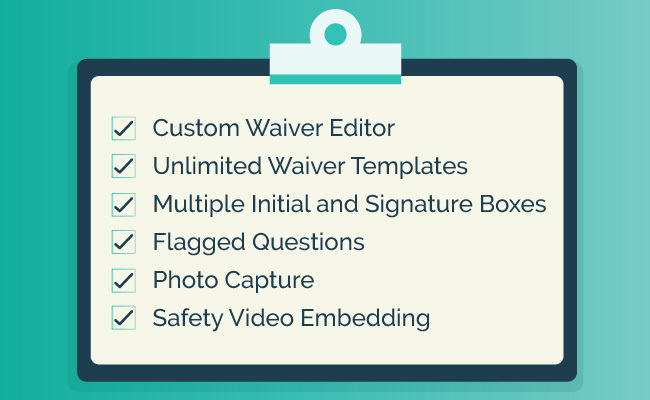 Safety video embedding helps ensure that your participants watch safety videos during the waiver signing process. It adds an element of safety during your organization’s activity or program. Be sure that whatever software you choose offers all of these features in every payment plan. It can be incredibly frustrating to invest in a scalable solution for online waivers, expecting to get all of the features but needing to scale up in price for access to a vital element. Look for a solution that is scalable in price in terms of the number of new waivers signed rather than features available. Thinking like this is imperative for choosing the best online waiver tool. It shows that you’re concerned about the user experience of your participants. While it’s possible to make your digital waiver look just like a paper waiver with simple PDFs, these may not create the best user experience. Find and fill out the required fields. Read the legal text on any device. Draw or type their signature. Gaining access to the waiver should be just as simple as filling it out. You might choose to include an option that allows your participants to print or send themselves a copy of their completed waiver. Be sure your organization is also prepared to send copies of completed waivers should participants ask for them later on. When you choose an online waiver tool, be sure to go through a demo where you can view and fill out a sample waiver yourself. This helps you see what your participants will see. One of the main reasons to switch to online waivers is because they’re easier for your organization to process. Instead of collecting tons of papers and trying to organize them in a cohesive way, you go digital so that you can streamline the collection process. Embedding a waiver widget. 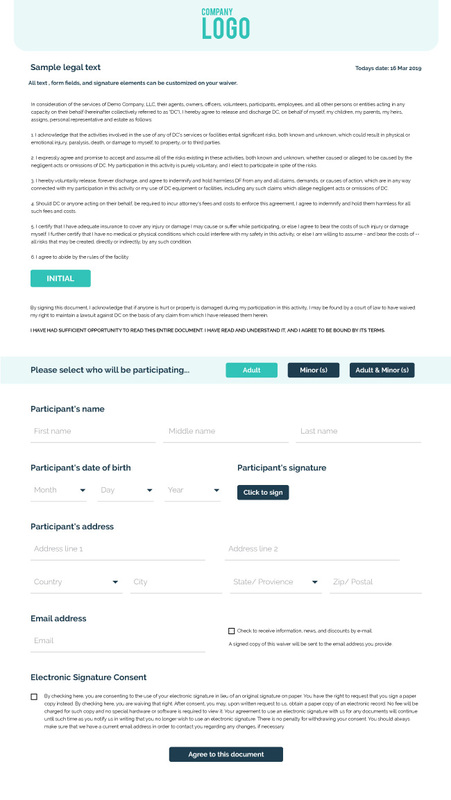 Waiver widgets help participants sign your digital waivers without ever leaving your website. They simply click the widget and it pops up on the screen. Including a button on your site. Buttons make great calls-to-action to help participants find your waiver. Connect them to it directly at the click of a button! Emailing links to the waiver. Add links to registration confirmation emails or activity reminder emails to encourage your participants to sign ahead of time. Using a waiver kiosk. Be sure participants can sign waivers at the activity itself with portable waiver kiosks. Look for software with a free app for your tablet for an easy DIY kiosk. Generating a QR code. Generate a QR code at the location of your activity so that participants don’t need to wait in line. They simply scan the QR code and sign from their smartphone. When you rely on technology to collect waivers, it’s important to be prepared for the worst. That’s why you should always bring extra chargers for your tablet-turned-kiosk (or an extra device altogether) and invest in software that can be used offline. Continue to collect waivers even when the internet goes down. When you collect waivers from participants, you gain access to a lot of data. With all of this information at your fingertips, managing it all may seem like quite the hassle. You can think about the management of data in two different ways: the management of the waivers themselves and management of the content the waivers contain. When participants arrive at your event or facility, you’ll want a quick and easy way to make sure they’ve signed a waiver or give them the opportunity to sign. Digital waivers that incorporate a check-in process help you keep track of who has signed. For those that haven’t signed yet, that’s when you use your handy-dandy portable kiosk! Be sure you always have access to your data by downloading it from the online waiver platform. Download the data as a CSV as well as the individual waivers as PDFs. Or, you can set up a synchronization so that copies of the waivers are automatically sent to your hard drive. Once you’re sure the waivers are saved in another location, set up expirations in the online waiver software. This allows you to keep waivers for a predefined period of time before they automatically expire. We briefly mentioned earlier how valuable the data is that is collected from waivers. However, with paper waivers, it would take hours upon hours of your time to record all of the data from each waiver into a spreadsheet. The beautiful thing about digital waivers is they can record this information for you! Once this information is collected, you can draw conclusions from variables such as when people sign, where they sign from, and other variables. Plus, add notes to the information collected in your digital waiver software for more complete views of the participants. Before investing in online waiver software, check to see if they have any integrations. Email marketing integrations help automatically transfer contact information from your collected waivers to your favorite marketing tool. Now that we’ve reviewed how online waivers work and their important elements, it’s time to discuss our favorite software selection: Smartwaiver. Smartwaiver helps you convert your existing waiver into a digital waiver to be signed at your location or from any computer, tablet, or smartphone. Their secure online database makes it easy to save information collected from waivers, search for relevant information, and export data to use as needed. You can also access this data through Smartwaiver’s powerful API for deeper integration. Track data. With Smart Trends, you can present customer demographic information with easy-to-use visuals to better understand activity trends. Use marketing data. Integrations with MailChimp and Constant Contact make it easy to use email marketing data and better reach out to your organization’s consumers. Embed your waiver to Facebook. Why limit your waiver’s location to just your website? Embed it on Facebook so your followers can easily find it no matter what contact platform they choose. Smartwaiver offers every feature in all of the plans. No matter if you need 100 waivers or 5,000, you’ll have complete functionality. Online waivers help organizations of all types make agreements with participants. Simplify the creation, signing, and collection processes by going digital with your organization’s waivers. The Ultimate Guide to Email Fundraising. Does your organization rely on donations? After collecting email contact information from your digital waivers, make sure you’re getting the most from it with this ultimate guide to email fundraising. Smartwaiver Events. If your organization is hosting an event that needs a waiver, check out Smartwaiver’s helpful feature, Smartwaiver Events! This article gives you all the information you need about how to incorporate signing waivers into your event management. 15 Fundraising Event Software and Tools. If your organization is preparing for an event, make sure you have all of the right tools in your toolkit. This Double the Donation article gives a list of the top software for nonprofit organizations.